Download the raw, full-frame FITS files from this folder. Absolutely no processing has been done to the files. They are the raw, unaltered images. Ask manufacturers for raw, full-frame files. Otherwise the shape of the stars can be misleading because they've either cropped in, loosing field coverage and not showing the actual performance you will obtain, or they have processed the images (also not showing you the actual performance). Real-world performance can only be judged from full-frame raw, unaltered images. The telescope is mounted on an equatorial mount, which is far more mechanically demanding on the mechanics of the optical system than an alt/az mounted telescope test. If you plan to mount the telescope EQ, make sure the sample images you are being shown were taken on an EQ mount. Focus position was not touched during these tests and on this design focus is sensitive to +/-8µ from the optimal focus position. Move outside this 16µ window and off-axis stars will go comatic. Dream is the industry leader in actual high-stiffness and high-performance opto-mechanical systems because from day one Dream has focused on engineered, high-consistency CFSC structures that chase stiffness, not strength. If an optical system requires focus, to compensate errors that can be seen as the telescope angle changes, it is a red flag that mechanical bending of the structures is occurring. Adjusted focus images are not a true indication of total performance. Ask a manufacturer for raw images where focus and collimation are not touched at all during testing. Sample images taken 10 minutes after the telescope was slewed to a new sky position show that Dream has unmatched stiffness; no focus shift due to sky location (slew to and immediately image) and no settling affect either. Because of the high stiffness and athermal nature of Dream's carbon fiber structures and zeroDELTA lightweight mirrors, our opto-mechanical systems are at the cutting edge of both mechanical and thermal performance. The CCD used is a KAI-11002 chip: 9 microns square, 4008 x 2672 (full-format, 42mm diagonal). Collimation of this and all of the Dream Astrograph telescopes is achieved by using the custom tools provided to our customers. They are used during the day and only once. Collimation was accomplished on the first day with this telescope, then it was not touched again (adjusting collimation would change focus). The ambient temperature was -7C (19F, +/-5F) during these all-sky tests. 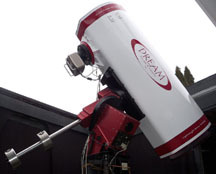 Dream has tested this telescope design over as much as a 20°F temperature change and still not detected degradation of the off-axis quality, all while leaving the focus position untouched. No other manufacturer is delivering this level of performance. Dream has been delivering performance since 2003. Use the file number and descriptions below as a quick reference to know what direction the telescope was pointing for that given image. 2660: Zenith, OTA on east side of mount. 2662: same as above but ~10 minutes later. 2666: same as above but ~10 minutes later. 2672: same as above but ~10 minutes later. 2673: Zenith but OTA now on west side of mount. 2675: same as above but ~10 minutes later. 2678: same as above but ~10 minutes later. 2681: same as above but ~10 minutes later. 2683: same as above but ~10 minutes later. You can look at data from two additional telescopes on this web site.